This is the first ever font I made, called "Roundico." Can't think of any other names, though. Well, it's been half a year since I last saw this! Now, I changed the J and some other letters a bit, and added some other extended characters from the Cyrillic category. Enjoy! 1. Space is VERY VERY thin. 2. E with acute, e with acute, lowercase sharp s and uppercase sharp s only given. I wish you'd like it! yup, you heard me, folks. @Rebecca2323 Fontstruct. Hey, tell you what, I thought that it was a total rip-off but with the help of Fontstruct, it helped me make my font. FOR FREE! Yup, you heard me, FREE! Why don't you try it? It'll be cool! I have tried it. It's complicated and long. I use FontForge. It's also free. You can check out my youtube tutorials or look at the fonts I made on here. @Rebecca2323 What platform do you use? Macintosh, Windows or Linux? When this reaches 200 downloads, I'll create an image using Roundico! Look at the fonts I made on here. @Rebecca2323 wait, i thought that was only for macintosh! Do you like the bullet? check the latest update in the description! Thanks for all the downloads, everyone! 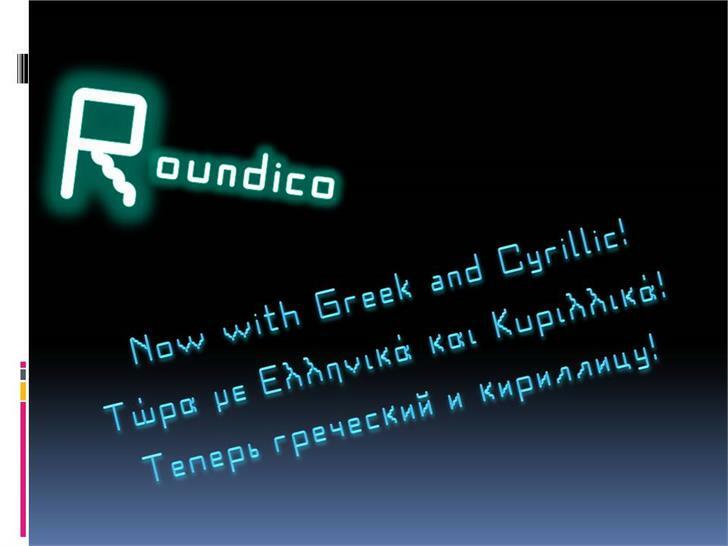 Coincidentally, I searched "roundico" in Google and I found out that it's on different websites! I'm also use FontForge. I geddit!